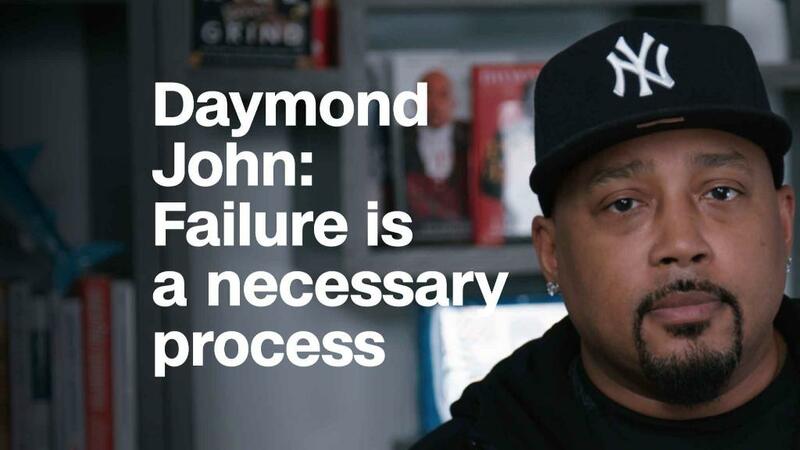 Daymond John always wanted to be an entrepreneur. "As a young kid growing up, I was always trying to sell something," John told CNNMoney. "Whether it was pencils in school ... Super Soakers on the beach. I was always selling something." At the age of 17, John decided to buy wrecked cars, rebuild them and sell the restored vehicles. After that, he started a commuter van line. But he wasn't passionate about either venture, and they fizzled out. When he was 20, he decided to turn his love of hip hop and fashion into the business that would help make him famous — the hip hop apparel company Fubu. Fubu had a few false starts. John recalled opening and closing the business three times between 1989 and 1992 because he lost money. But his love of the company always drew him back in. "People would say, 'Hey, I remember you. I bought a shirt from you last year ... Where can I find it again?' And I was happy to hear that," John said. In 1992, when Fubu was officially in business. John worked out of his childhood home in Queens, making hats and T-shirts with his mother and business partners. While John was trying to get Fubu off the ground, he worked at Red Lobster and continued to drive the commuter van. "On the weekends I would take the seats out of that 15-passenger van, pack it full of Fubu and go down to a festival and sell Fubu, and then sleep at night in the van, to then go to another festival," John said. He and his partners marketed their products to cool kids in their neighborhood. And then they decided to try to get rapper LL Cool J to wear Fubu. "I would camp outside his house," John said. "We need[ed] a spokesperson, a face," he said. Just a few years after Fubu launched, the rapper agreed to be photographed in Fubu, and everything changed. "He took that one picture for us, and after we put that in a small magazine, we got calls from everywhere," John said. "He would then go on to be our spokesperson and take us to a place that we never thought we could go." LL Cool J became the brand's spokesperson, and Fubu became a phenomenon. "I was technically retired when 'Shark Tank' came around," John said. But, he said, "anytime that somebody wants to work with me is a perfect time for me." John has been on the CNBC reality investing show since it began in 2009. The show made him a "brand," he said. People stopped thinking of him as the Fubu guy and started to see him as a versatile businessman. The show also made him a role model, he said. "People have grown up on it and I'm part of a cast of people who hopefully influence the next generation," he said. Even if it's a generation he doesn't always understand. "I see kids coming up to me with these big old bushy beards," he said. "They may be 25, but they don't look 25. Kids these days look like they're 40, right? And they're going, 'I grew up on "Shark Tank."' And I'm like, 'This lumberjack grew up on "Shark Tank"? This guy's like 40 years old.'" "Shark Tank" opened doors for John. In 2015, President Barack Obama appointed him one of nine Presidential Ambassadors of Global Entrepreneurship. "I got to travel the world with President Obama. I don't think that would've necessarily happened" without the show, John said. And, of course, the show has given him new companies to invest in, like Bombas socks and the novelty sunglasses maker Sun-Staches. "Shark Tank" also taught John some lessons. "The best advice I've ever gotten is never do a deal with Kevin O'Leary," from 'Shark Tank,' he joked. "The second-best advice I've ever gotten is money is a great servant, but a horrible master." Along the way, John said he had "2,000 moments of self-doubt." His Fubu partners gave him strength when he wanted to quit, and he did the same for them. And even though he lost large sums of money along the way, he doesn't really feel that he's taken any risks. "There's nothing that I regret," he said. The only risk he can imagine would be "being too ignorant to change with the times." John sees his earlier sacrifices and failures as tools he used later. "Most people, when they run across these pains or these challenges, then they don't know how to cope with them," he said. "I knew how to cope with them." "Failure," he said, "is a necessary process."